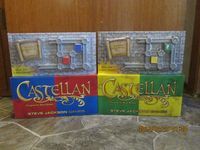 You will receive two copies of Castellan, the Red/Blue version and the Yellow/Green version. This will let you play 2-4 players. Games have been removed from the original vacupacking, played, bagged, and put into the actual boxes. Condition: Played a handful of times. Still in very fine condition. Version: Both the Red/Blue version and the Yellow/Green version.